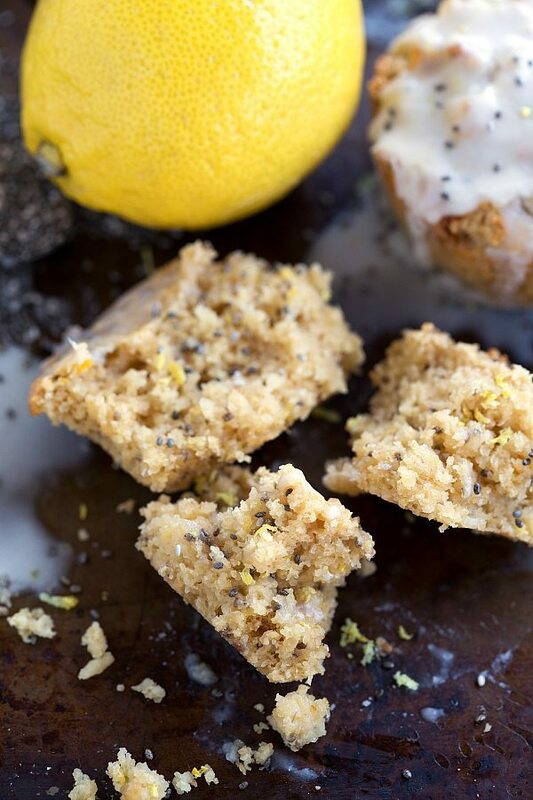 Gluten-free and healthy lemon chia seed muffins. 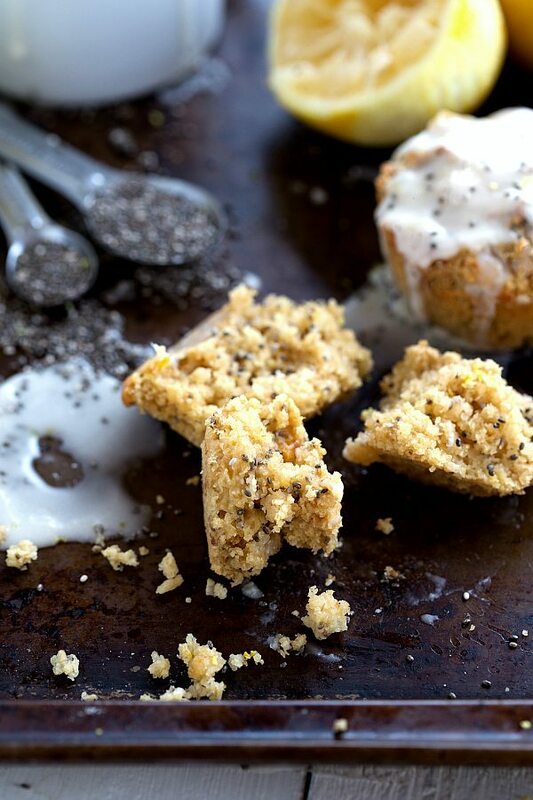 The chia seeds could also be replaced with poppyseeds for a delicious traditional lemon poppyseed muffin. These muffins are free of refined white flour, oil, and butter. 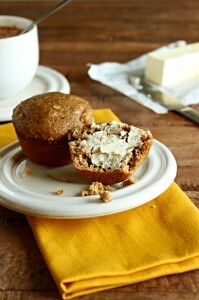 Leave off the glaze for an even healthier muffin! It’s kind of funny how often muffins are on the blog and how often I make them, because I never really ate ’em growing up. And then in college occasionally I did, but not that often. However, since being a mom, I make a batch at least once a week. Oh, and that is how often I make them with only one kid. He barrels through muffins like it’s nobody’s business. They make him so happy and he is always asking for more. And by asking, I mean pointing and grunting in the direction of where they are kept 🙂 PLUS they are a lot healthier than store-bought muffins so it’s totally a win-win. Lemon flavored is a new one, and then adding chia seeds were pretty much destined for these muffins. I recently became obsessed with chia seed pudding and started putting them in breakfast cookies. So why not in muffins? Not to mention that huge bag that I need to use up! So chia seeds in everything it is! But don’t be scared away if you aren’t on the chia bandwagon yet, because poppy-seeds are a totally acceptable substitution in these muffins. 2 – do NOT use bottled lemon juice. I mean the recipe does call for zest anyways so definitely buy the lemons. The zest of the lemons add a ton of flavor and freshly squeezed lemon juice is always going to have more flavor than bottled lemon juice. So definitely use a real lemon! Preheat the oven to 350 degrees F. Generously spray 8 cavities of a muffin tin with nonstick spray. Do not use muffin liners as these muffins will stick to the paper. Zest a large lemon and then juice the lemon. Combine the 1/2 tablespoon lemon zest and 2 and 1/2 tablespoons lemon juice in a bowl with the honey, sugar, yogurt, and vanilla extract. Stir together and then add in an egg. Stir until combined. In a blender or food processor, blend regular old fashioned or quick oats until they reach a flour consistency. Measure the oat flour AFTER blending and not before. In another bowl, stir together the chia seeds, oat flour, and baking soda. Combine the wet and dry ingredients and mix until just combined. Over stirring the muffins will result in dense muffins. 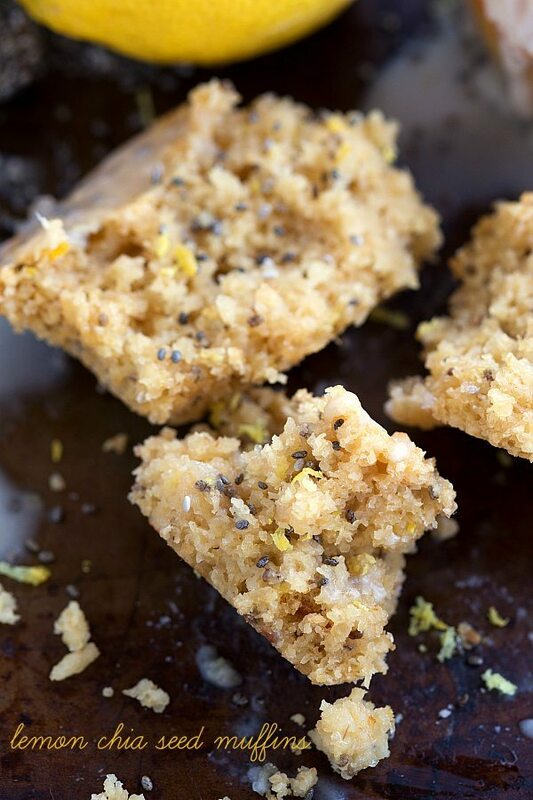 Add more lemon zest if desired and then pour the muffin mixture into the prepared muffin tin. You can fill them pretty full as these muffins don't rise too much. Bake for 18-20 minutes or until lightly golden on top and a toothpick comes out clean when inserted in the center. Remove from the muffin tin and allow to cool. If desired, mix a glaze by stirring together the powdered sugar, vanilla, and lemon juice. Start with 1/2 teaspoon of lemon juice and add more if needed to thin. It does not require a lot of liquid to make the thick glaze. Pour the glaze evenly over the muffins when they are no longer hot and allow to set-up on the muffins. The glaze is delicious, but makes these less healthy. If you want a healthy muffin omit the glaze. 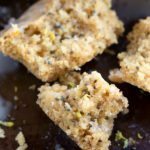 I have never baked with chia seeds but I think you convinced me! And lemon anything just makes me all sorts of happy! Pinned! I TOTALLY had the idea to make chia seed lemon muffins too. And now I don’t have to because you did the hard work for me! Love a carby treat that I can feel good about eating! Pinned! 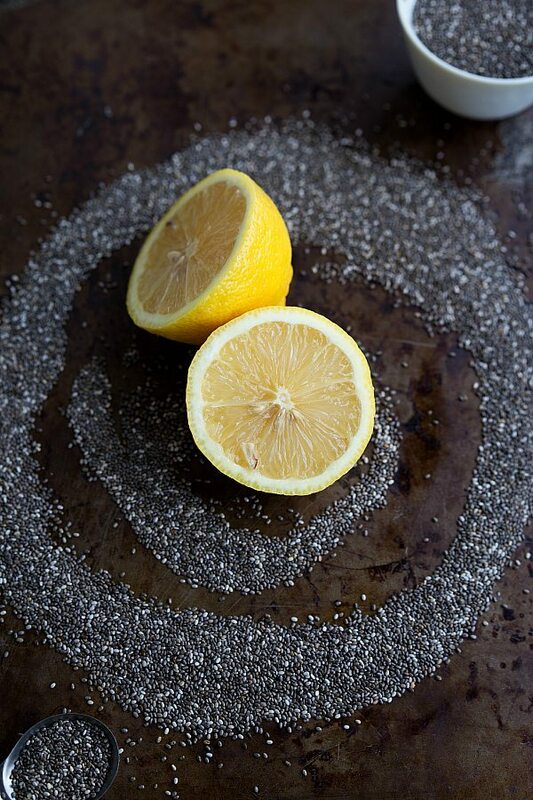 Chelsea- your picture of the lemons amid the swirl of chia seeds is inspired! What beautiful work. 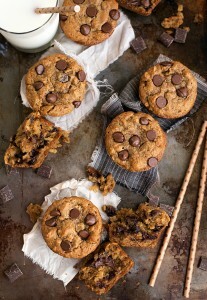 The texture of these muffins looks ever so good, too. Your pictures are so gorgeous, Chelsea! I love that these cuties are flourless and full o f lemon. And such a great idea to add in chia seeds! Pinned! Totally into citrus right now, and these babies look just perfect! Happy Friday love! Hope you having fun in BALI! These look incredible, Chelsea! I love all of the citrus popping up lately! I’m longing for spring. Have a wonderful Friday! I love your son’s point-and-grunt method. I wish that worked for me and dark chocolate! 😉 Your gorgeous muffins have convinced me that I need to give chia seeds another go. Pinned! These muffins look so tender and moist. I love everything about them. Pinned. Now THIS is my type of breakfast! 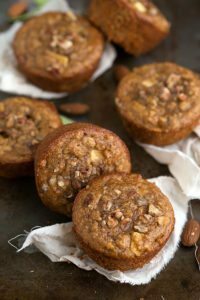 I’m all over muffins that are healthy! And the lemon must make these super bright tasting! These are super! Light and fluffy all they need is 1/2 a tablespoon more zest (If you don’t want the glaze). Mine were’t quite lemony enough. Do you think I could use nonfat vanilla greek yogurt in these?? Thanks.. can’t wait to make these! I just tried these in my dorm, because I don’t have flour but can grind oats into oat flour myself, and they turned out quite gummy! I left out the vanilla extract and used brown sugar instead of white but didn’t expect a huge difference from the substitution. The batter was delicious though. Any tips for next time? Made these muffins this morning, substituted sugar for a packet of stevia. Super good however missed the step to NOT use paper liners. So glad you liked them! 🙂 And hopefully you were able to get them out of those paper liners okay! I don’t have a lemon. Could I use an orange instead? I don’t think an orange would be very good in these. The lemon is quite integral! Does anyone know how many calories roughly are in each muffin? ? alternatives-rice, spelt flour, no taste and hard like chalky taste.. I am slowing changing my eating habits for more optimum health instead of dieting (fall of wagon too often)….i was surprised that i could only eat 1/2 muffin & feel satisfied! in fridge,oh yes…shredded coconut & splash of coconut rum from cruising in islands…cant wait to eat one!